I thought I was being nice to my children by putting sunscreen on them whenever I bring them in the sun. I followed the directions and slathered it on them till they were all greased up and shiny! I find out the other day that I am messing up again! Not only do I have to protect them from the sun, I also now have to protect them from chemicals in sunscreen! Holy pressure batman! 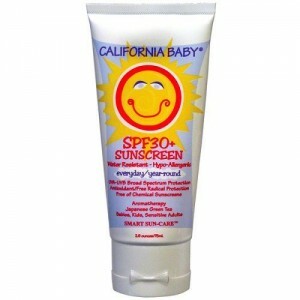 I found a sunscreen I loved to put on my kids, Banana Boat Sport Sunblock Lotion, SPF 50 . No Tearing, Hypoallergenic, Waterproof. It does not burn if it gets in my kids eyes and I feel comfortable putting it on their faces. Well come to find out that it has horrible chemicals that cause hormone problems. So here are the chemicals I have been putting on my kids and what is dangerous about them. These ingredients are linked to cancer, developmental and reproductive toxicity, neurotoxicity, persistence and bioacculmation, organ system toxicity (non-reprodutive). It can cause irritation, on the skin and in the eyes or lungs. The product also has enhanced skin absorption and contamination concerns. So I thought I was doing the right thing, I was using a sunscreen that did not specifically list the chemicals that I was supposed to watch out for: Oxybenzone and benzopheone-3. Sunscreens that I am supposed to look for have zinc oxide or titanium dioxide and higher spf than 30. When I find something that I like as well as my Banana Boat Kids I will share. I am going to start with California Baby. Peg Perego Pliko P3 Review: Life is too short to push an ugly stroller. I am a stroller addict, I love them! I love new features, I love looking at other peoples strollers, I love shopping for them, if it were up to me,, and I had all the money in the world and all of the space in the world, I would have 6 of them! At one point I had 5 strollers, now I am down to only two. Of those two, I only have one stroller that I use daily. I choose the Peg Perego 2009 Pliko P3 Stroller . I like that there is a cup holder for me, many multi function strollers do not have any attachments like cup holders included. I like the freedom of movement 5 pt harness. My little guy is at the point where he could dive out of a lapbelt only in a second, and with this freedom of movement 5 pt harness, he can lean forward look around without me worrying he is going to take a head dive, because I know that he is buckled in tight, the best thing is he does not mind being buckled in because he is not stuck to the back of the seat like normal 5 point harnesses. If you watch other parents who have other strollers with 5 point harnesses, they don’t use them correctly because they don’t want their child angry and stuck back in the seat because it is too tight, so they loosen it up, then their kids can escape and risk falling out of the stroller. I have seen it happen. This risk of falling is eliminated in this harness system. I love the sun canopy with the rain guard attached, I can’t figure out why you would ever take it off actually. It folds down to create a weather proof clamshell and it is wonderful. I have used it in the coldest times of our Minnesota winter to keep the wind off of my baby. I have used it to keep the rain off of him during an unexpected storm, and it works great for sun, I have also closed it to just keep a sleeping baby sleeping because it keeps it helps keep it plenty dark in the stroller. Even with the cover shut you can look thru the peekaboo window and see that he is still sleeping comfortably. I ultimately bought the Peg Perego 2009 Pliko P3 Stroller for the toddler board in the back, this gave me the ability to push a single size compact stroller and have two children riding, the toddler on the toddler board is right in front of you and can see where they are going while facing forward!!! They are safely between your arms and with the handles extended you have full range to walk in full stride without hitting the toddler board. This was something that people complained about repeatedly with the aftermarket toddler boards that cost over $100. It turns on a dime with all four wheels, I have actually never used the locking wheels but they are there if you want them. This stroller doesn’t have the crazy spinning wheels like I have seen some Graco’s with the front spinning wheels moving their own direction or two different directions when you are trying to make small movements in tight places. I love the seat extender/leg rest that you can put up and down depending on your child’s age. When my little guy is laying down I fully extend the leg rest and it holds his legs up to help keep him sleeping, it can even be tipped all the way up to keep the wind out of the stroller almost completely in cold weather for little kids. It is easy to clean and all of the food that has been consumed and smeared on it from picnics and walks comes off no problem. The seat is comfortable and it has lightly padded sides for when your child needs to take a nap in the stroller they will be able to sleep comfortably without having their head resting on a bar. The few negatives, If your toddler is standing on the back and leaning to one side it can be harder to control the direction of the stroller and you may end up having to push harder with one arm to keep it straight. You also need to have a child in the front of the stroller to safely have a child riding on the toddler board without risking it tipping back. I wish the basket was openly accessible from the back and not only the sides. I wish I could put my whole diaper bag under the stroller but it is tough to get it in and out with the side access, so I simply just hang it from the handle which works just fine. Yep that is pretty much the only things I wish they could fix in upcoming editions of this stroller. Everytime I use my stroller I see people looking at it and hear comments like, “That is cool!”, “Look, at that kid can stand on the back! “That is the stroller I want!”, “What kind of stroller is that?” If they ask I am happy to tell them that it is a Peg Pergo Pliko P3 and that I love it and highly recommend it to others! 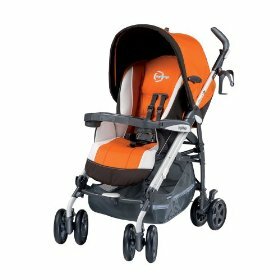 The Peg Perego 2009 Pliko P3 Stroller is unique and wonderful! I have the orange, it is manly enough that my husband does not mind pushing it around, and it is tall enough that he does not have to bend over to hold the handles. I love that this will last for my kids when I only need it for one, or if I have a kid with sore legs, she can hop on the back and hitch a ride. The best thing is that I am not pushing around a huge double stroller and having my littlest one 4 feet in front of me because my stroller is so rediculously long. Every stroller has a purpose, and after owning 6 other strollers I have figured out that I like to have a compact, neat looking, well made stroller, that works for both of my children.